WE ENJOYED A LIVE INTERVIEW with Paul H. Smith, Ph.D., and even if you weren’t on the call, now you can enjoy it too! 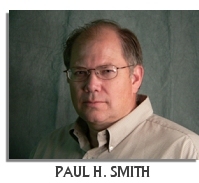 Paul was a remote viewer for the U.S. Army at Ft. Meade, Maryland, for several years. They were considered valuable enough to the Army to keep the project going. He described “intelligence firsts” in his work for the Army, like a scoop if you were a journalist. How is this useful for therapists? We sometimes feel intuition about our clients. Smith points out that his remote viewing training has greatly enhanced his intuition. So you might benefit from developing your intuition. I think there is an aspect of remote viewing that I find very helpful in therapy, the concept of “mental noise.” More on this down the post. “I don’t know if you got to listen to the interview or not. Here’s something that I can dogmatically say no mentalist could have done. “In 1979, satellite imagery showed the construction of an enormous building in Shipyard 402, the Soviet shipbuilding facility. The building was not on the water, or even close to it, but about 400 meters from the sea. All human intelligence sources were blind, unable to tell what was going on. Americans were desperate to know what was going on in the building. “The RVers were asked what they perceived. The created sketches of a large building. “They were then given feedback, the satellite photos which showed they were correct, and asked what was in the building. “They sketched overhead cranes, tracks, and a very deep and long area. They then sketched a large structure that was described as a submarine, but far larger than any ever seen. They sketched tubes forward of the “sail” or conning tower, which they said were for launching missiles. “The Navy experts rejected this possibility. The structure was too large for a submarine, and missile tubes were always aft, not forward of the sail. The building was a quarter mile from the ocean. It made no sense, it was impossible, and, anyway, psychic spying is all nonsense. “Robert Gates, in particular, completely rejected this perception. Later, Gates played a role in dismantling the psychic spying program, ignoring their successes because he was sure there was nothing to it. “But every aspect of McMoneagle and Trent’s description was soon confirmed. The Soviets built an enormous canal from the sea to the building, and let it fill with water. Then out came the secret product. The Soviets had created the so-called “Typhoon” class of submarines, and the western navies were caught completely unprepared, because they had rejected the remote viewing data. The subs carried missiles and the launch tubes were just where they were predicted, forward of the sail, and where sub experts said they would not be. “When you read the Remote Viewing entry in Wikipedia, there is not any mention of this or any of the other dramatic successes of the remote viewing program. There is no mention of Jessica Utts, currently the president of the American Statistical Association, who found there was substantial and significant support for the value of remote viewing. In true 1984 fashion, the materialists must deny the data and try to shove nonconforming history down the memory hole. I promised prizes to my subscribers. Now how do you go about winning my books? Try this challenge: On April 20, 2016, around 5:45 PM Mountain Daylight Time I was holding something in my hands. Focus on colors. Write down impressions. Sketch or draw your impressions. Focus on history of the object. Send me the description of all the impressions. I will give prizes to anyone who comes anywhere close. No limit to the number of prizes. Your description has to somewhat match my target, though. If you right-click (Command-click on Mac) you should be able to download the whole interview to your computer, or just click on it and you should be able to listen. None of my listeners (mostly shrinks: social workers, psychologists, and similar scruffy folks) identified the mysterious object. They didn’t come close! I picked it for a significant meaning it symbolized. The contest did NOT expire. No one won any of my books. Apparently shrinks have mediocre intuition. So anyone who can identify it, please email me at the address above. Of course, you have to convert it into a real email address. SPECIAL FIRST PRIZE: The first person who can accurately describe what I was holding, I will buy them a copy of Smith’s newest book, The Essential Guide To Remote Viewing. I am sure I can get Paul to personalize the book. So, you who follow Paul: Here’s a fun little experiment to see if you can describe the target. The books are still on the table!